Many people think one of the best outer thigh exercises is the outer thigh workout machine. While the outer thigh machine can help to strengthen the hip muscles, it is NOT the best exercise to strengthen the outside hip muscles (abductors). Standing Cable Abductions or standing resistance bands side stepping are much more functional choices for strengthening the outer hip, and lunges and steps are also great exercises. But if you prefer the machine then it's okay to stick with it. 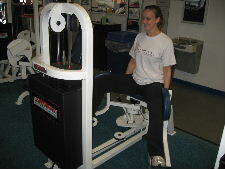 Here are pictures and instructions for the abductor/ outer thigh machine. Starting Position: This one has a relatively simple set up. Sit comfortably in the machine and position the pads so that they are as close together as possible while touching the outsides of your knee and thigh. Form: Exhale and push the pads outwards as far as you can go comfortably without compromising your posture. Hold for a brief second when your legs are apart and then slowly return to the starting position. Personal Trainer Tips: This is a simple exercise, make sure you adjust the machine so that you can get the most range of motion possible while keeping good posture. A Better Outer Thigh Exercise! If you read my article on outer thigh exercises, then you understand that most of the outer thigh is actually the quadriceps muscle that works on the knee joint. I more often recommend leg exercises that are done while standing because you get more bang for your buck. When you are standing, you improve balance, core stability, and strengthen the ankle, knee, and hip muscles at the same time. However, when you are sitting you generally focus on one muscle group at a time and don't get the improvement in core stability or balance that you would if you did standing leg exercises. I am a huge fan of 1 leg exercises and balance exercises. The hip muscles (outer hip muscles) really work to stabilize the hip when you are standing on one leg. 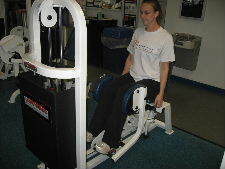 1 legged and balance exercises will work your outer thigh muscles much harder than the seated outer thigh machine. One of my favorite outer thigh exercises is standing cable abductions. It works on balance, ankle stability, knee stability, and hip stability, and it really works the outer hip and thigh muscles. You can work your hip muscles in isolation one at a time or you can work multiple muscles at once. There is nothing wrong with using machines for part of your leg workout, but try to include standing exercises like squats, lunges, or balance exercises in your leg workouts. 1 leg balance exercises, squats, and lunges are among the best outer thigh exercises. You can choose many different exercises and mix them up to get a different workout. Try one of the leg workouts on this site or use the exercises and tips to make up your own.